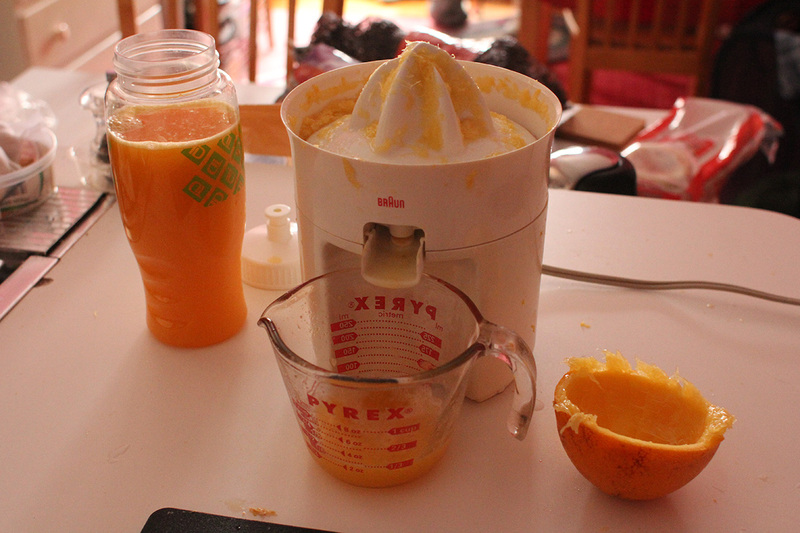 i ended up using up all the oranges i had to make juice: 5 small 3 large. 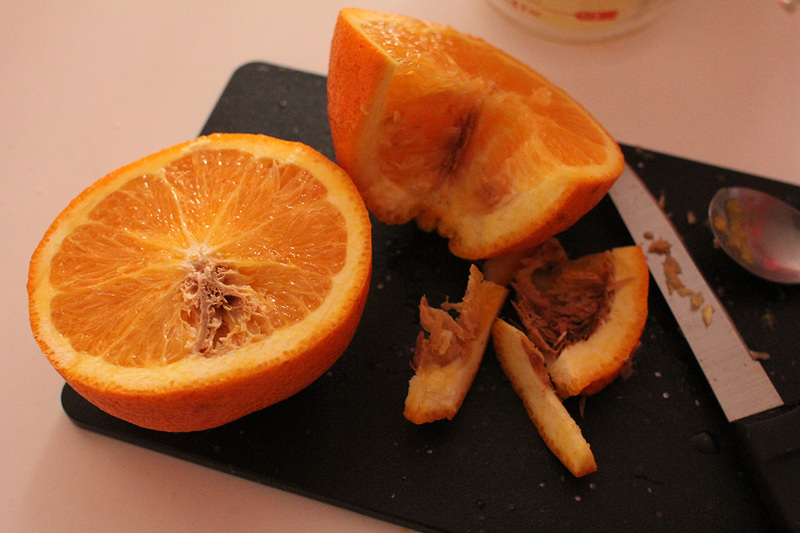 originally i was just going to use a single large orange, but when i sliced it open, some parts of it were rotten, so i didn't get very much juice. 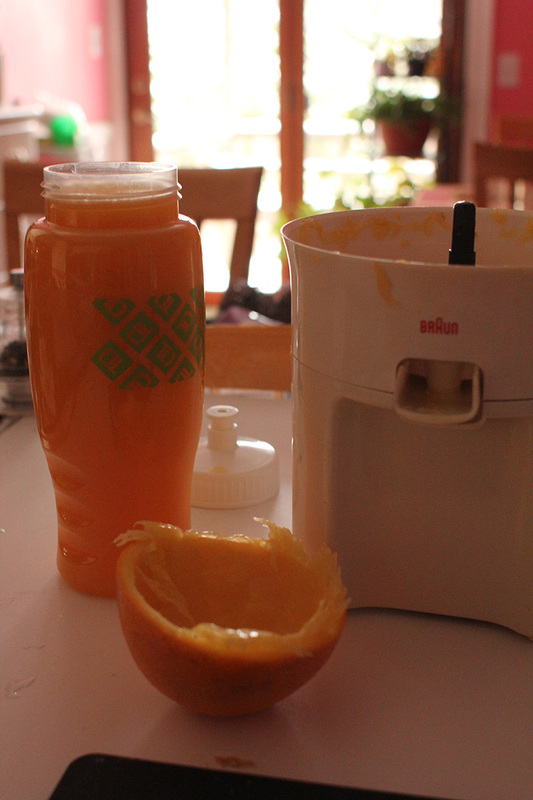 as i had 2 large oranges left, i decided to juice both of them. 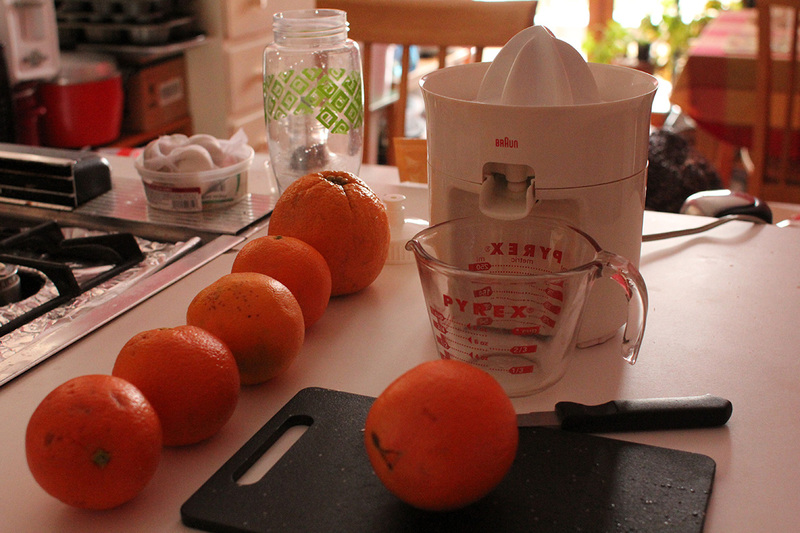 my father came to pick me up in the afternoon. 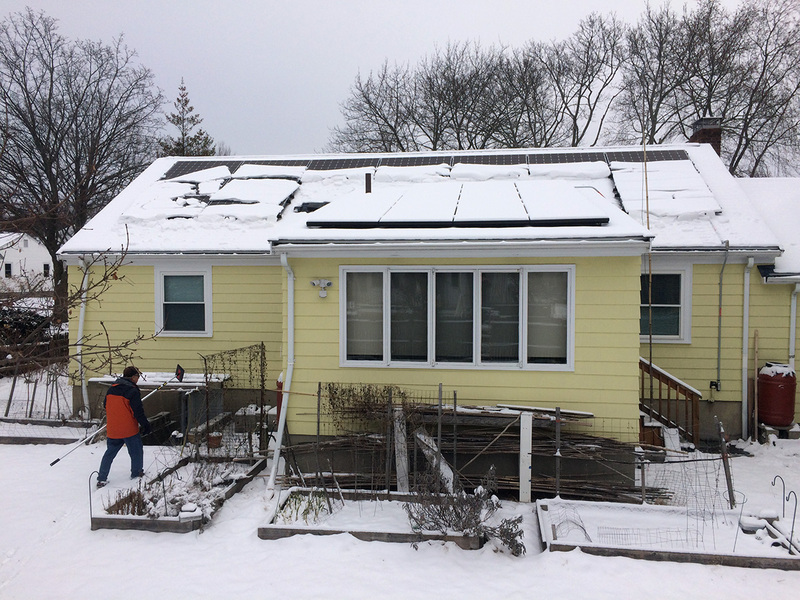 what i thought was to be a dusting overnight turned out to be enough snow to warrant a solar panel cleanup. 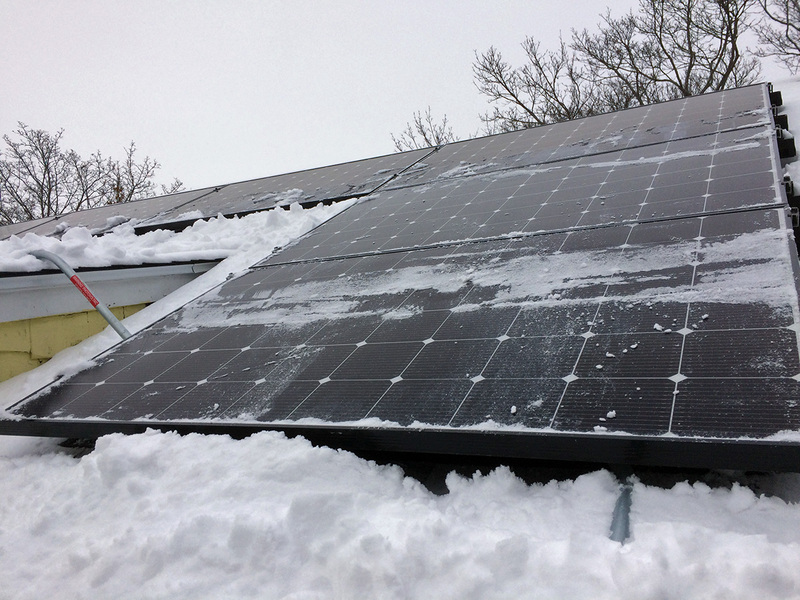 as tomorrow looked to be a sunny day, it was a good idea to clear the panels while we still had time. 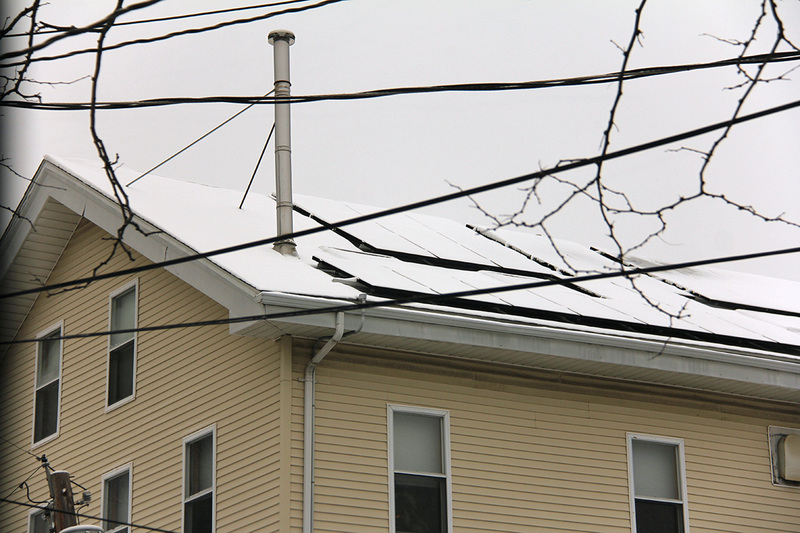 i was ready to climb onto the roof to do the cleaning, but my father said we could do it entirely from the ladder. 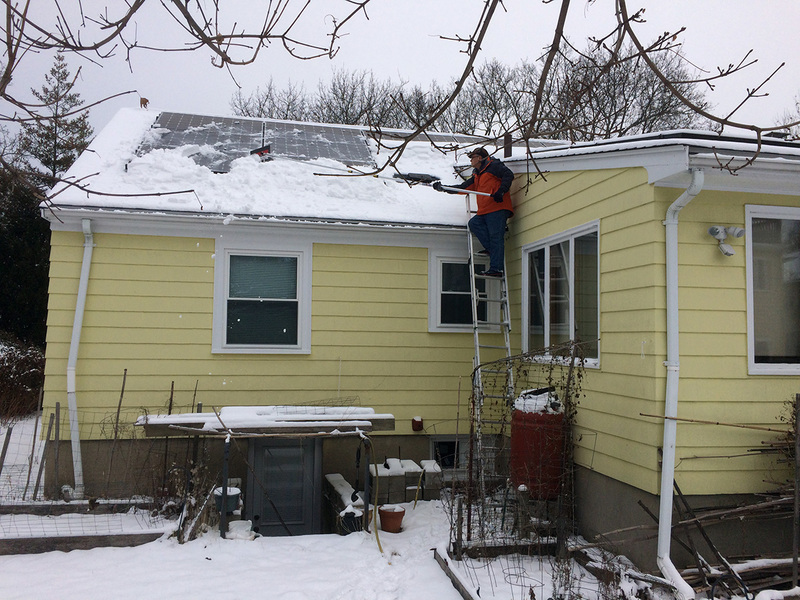 i didn't believe him, but apparently our foam snow rake has enough reach to clear all the panels from alternating sides of the sunroom. 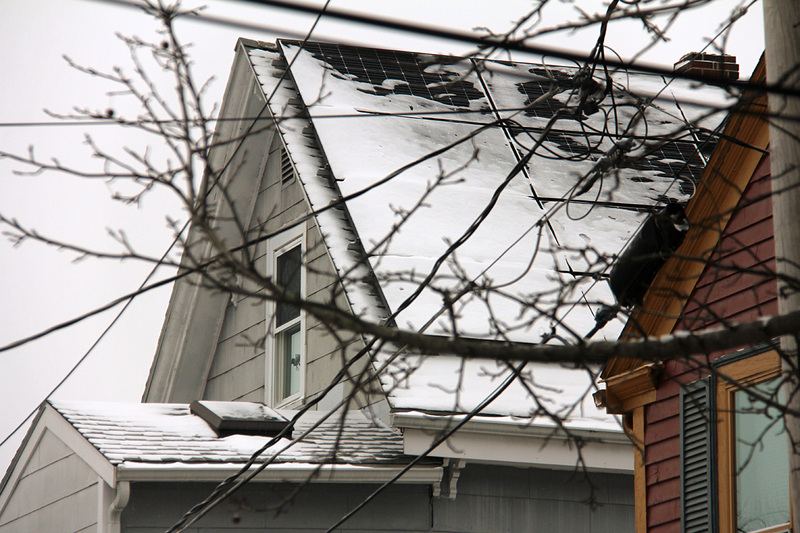 the snow that fell was the light fluffy kind, prone to avalanches. 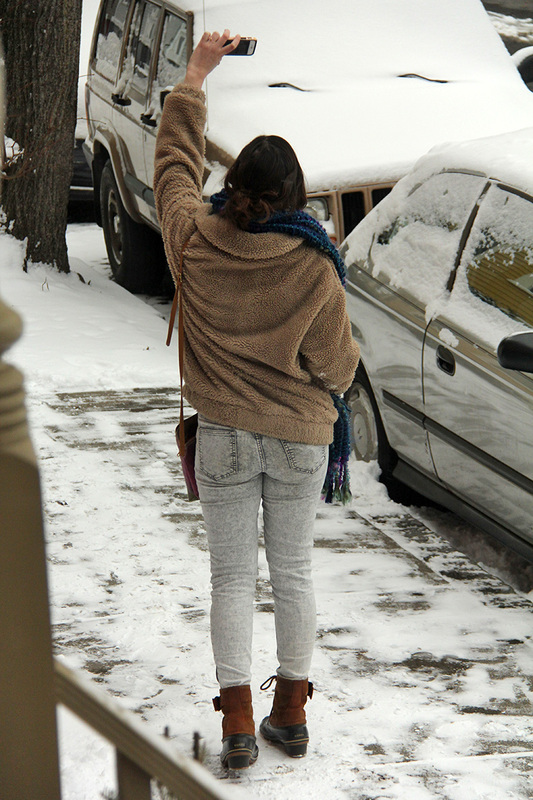 all we had to do was hit the snow from up high and the rest would come sliding down. 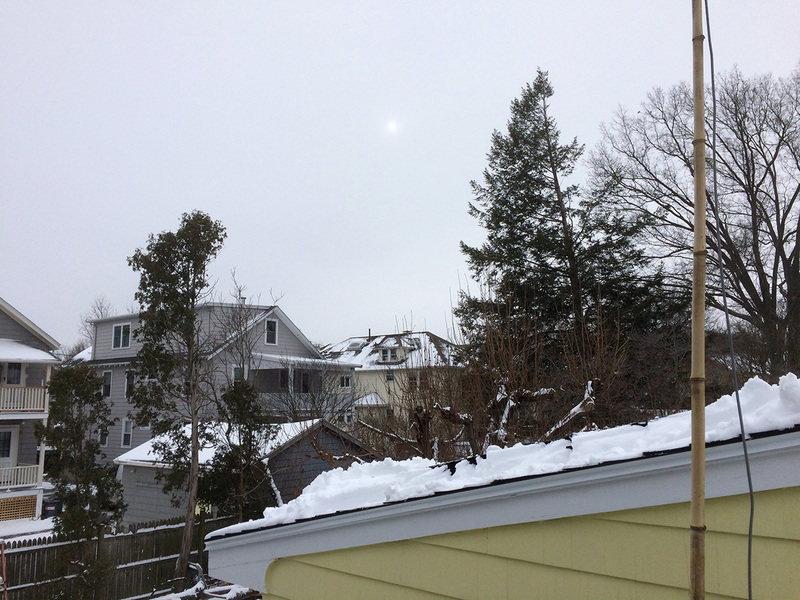 despite the thick grey sky, i could still make out the faded glow of the sun. 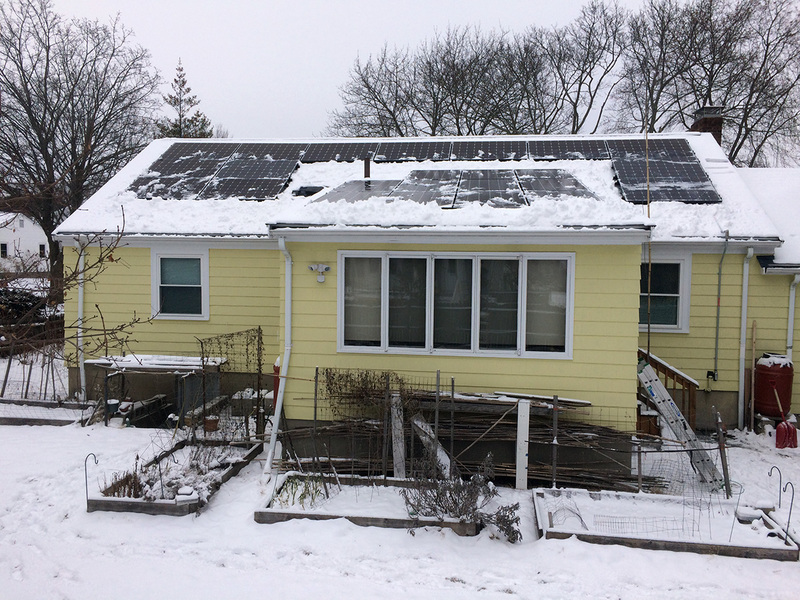 the moment we cleared the snow, the production jumped from 100W to 800W; however we never made it to 1kW, and the total production for the day was a measly 1.53kWh. 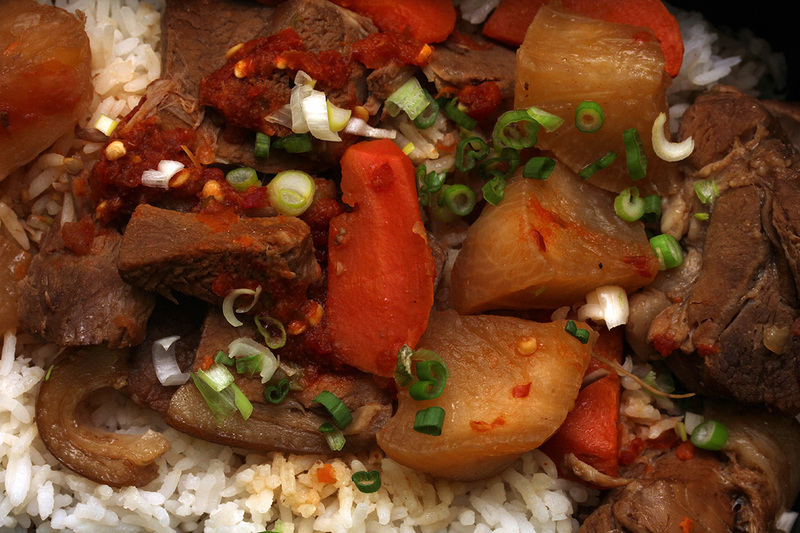 my mother packed me some dinner which i took when my father dropped me off back at my place. 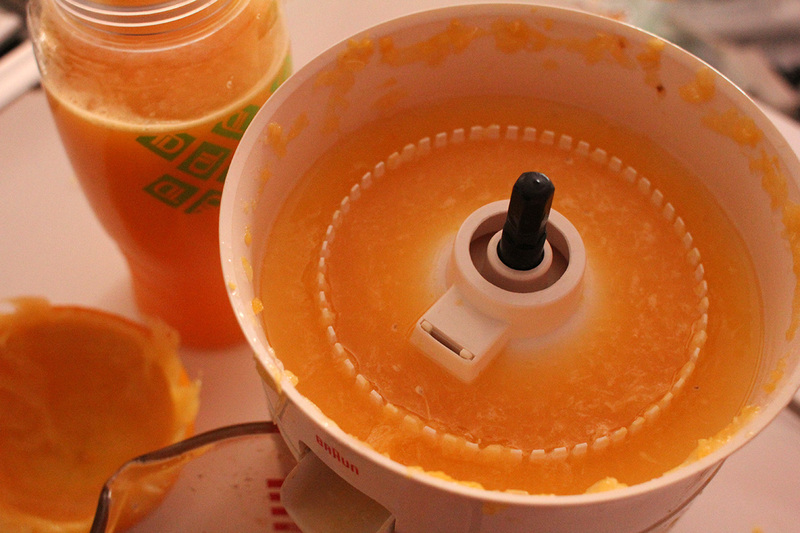 i finished ancillary justice today. towards the end i couldn't put it down, reading it everywhere, from the bathroom, to the couch, to hours in bed. it got to the point where i couldn't wait to go to sleep just so i could continue reading. 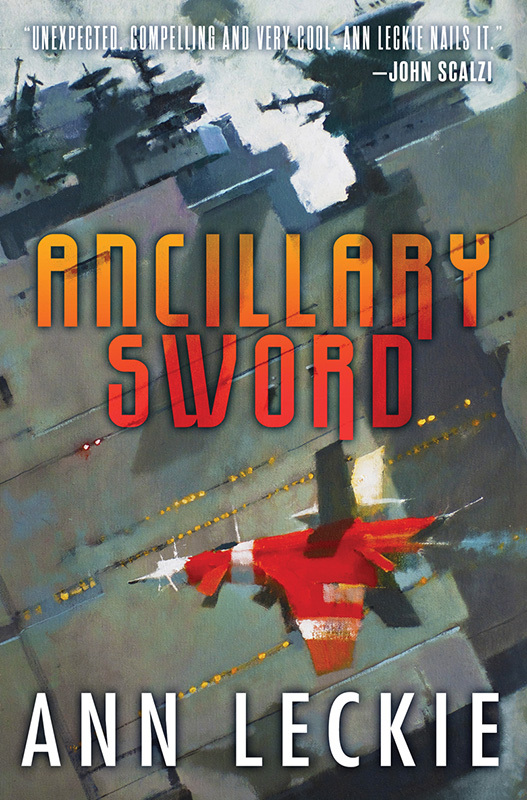 i downloaded the two other books in the trilogy, ancillary sword and ancillary mercy. i also downloaded a few other books, i'm on a reading kick these days. 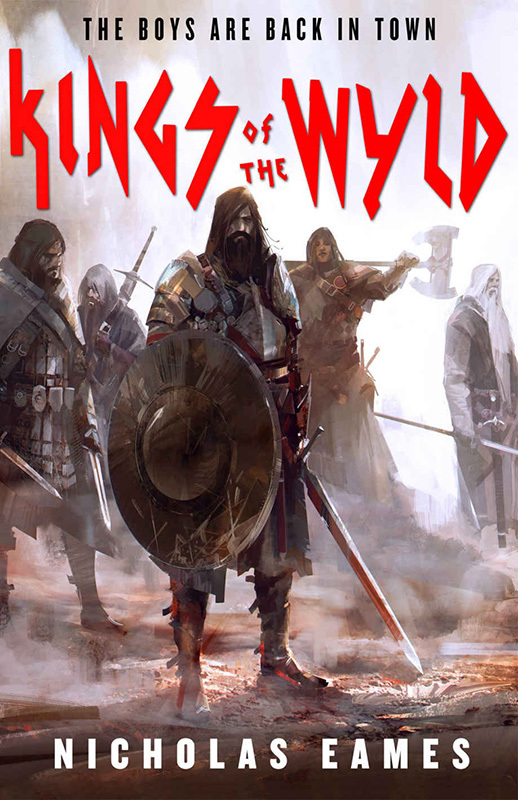 kings of the wyld by nicholas eames, which was advertised as a fantasy where mercenaries are treated like rock stars, and some other review compared it to a cross between george r.r.martin and terry pratchett. 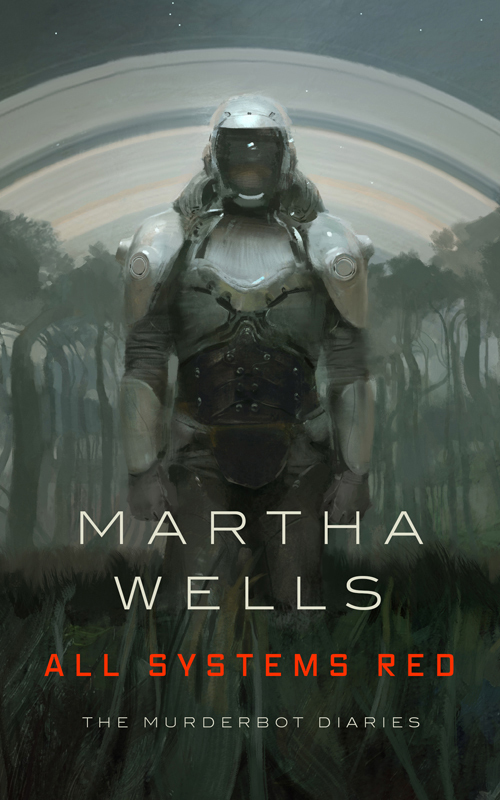 all systems red by martha wells. i didn't think anything of it at first, with a rather bland cover, but the tagline "the murderbot diaries" got my attention. 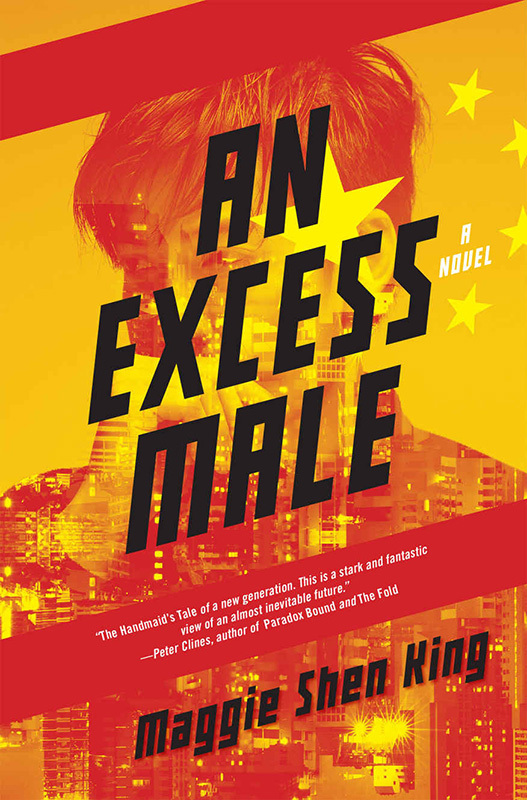 i read a bit of an excess male by maggie shen king, about a dystopian future where china because of a gender population imbalance institutes a new family policy where a woman can have 3 husbands. it's an interesting premise but i don't know if i'm invested in reading a whole novel about it (short story would be better). 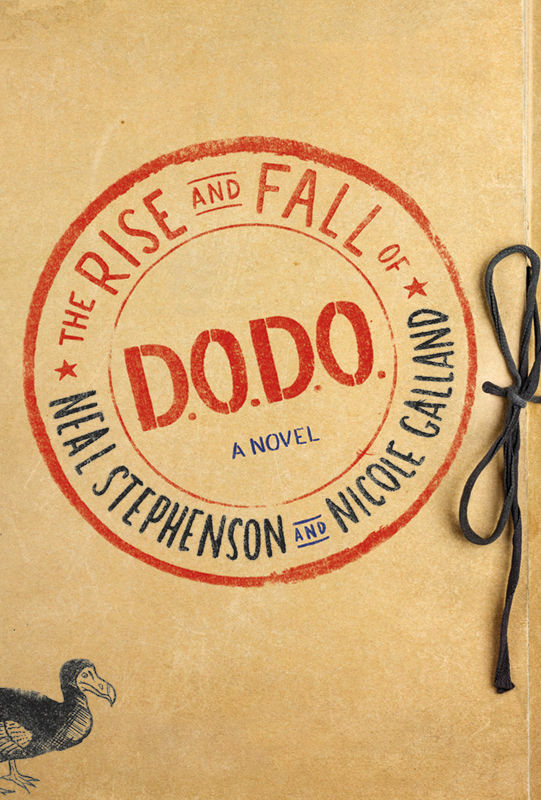 the rise and fall of dodo by neal stephenson and nicole galland: the only neal stephenson book i've ever finished was snow crash, i've read several of his other books (diamond age, cryptonomicon, seveneves) but have never finished them. 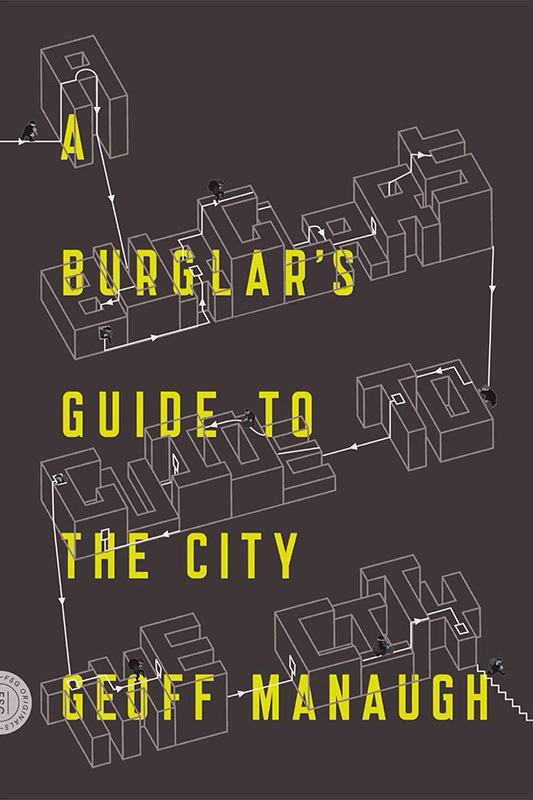 a burglar's guide to the city by geoff manaugh sounded interesting, but it will be at the bottom of a very long reading wait list.